Following the trend of genre-hopping all over the place… this week’s movie recommendation comes in the form of an action/adventure/mystery/comedy. Sahara. Another movie that has a little bit of everything… which is apparently a recipe for a movie that I am guaranteed to love to pieces. This is one of those movies the critics initially hated, but I loved. It tends to work out that way the vast majority of the time. It is also the kind of movie where there is a lot going on, and at first glance, none of it seems to be related. Meet Dirk Pitt: a sort of modern-day Indiana Jones searching for a lost Civil War era ship that has aboard it a box of legendary gold coins minted by the Confederacy. Though finding this legend is his main goal, he also has a real job with the National Underwater Marine Agency as a salvager of wrecked ships, which he uses “to pay the bills” as Inigo Montoya would say. At the other end of this story, you have Eva, a doctor with W.H.O. who is investigating the source of a strange outbreak in Africa. When their paths and stories collide, the discoveries that Dirk and Eva make are bigger than either of them expected. This movie is an all-out adventure. The plot twists and turns like a snake in the desert. All while Dirk’s best friend, Al Giordino (played by the ever marvelous Steve Zahn) provides quippy comic relief… but don’t worry he isn’t just a humorous side-kick, this guy knows his stuff and is very good at what he does. Possibly one of my favorite roles for Matthew McConaughey ever… except for one other… which I will talk about next week. If you skipped this movie back when it came out in 2005… you should definitely remedy that and give it a look now. It is so much fun, and has some of the best quotable lines since The Princess Bride. (And THAT is saying quite a lot). 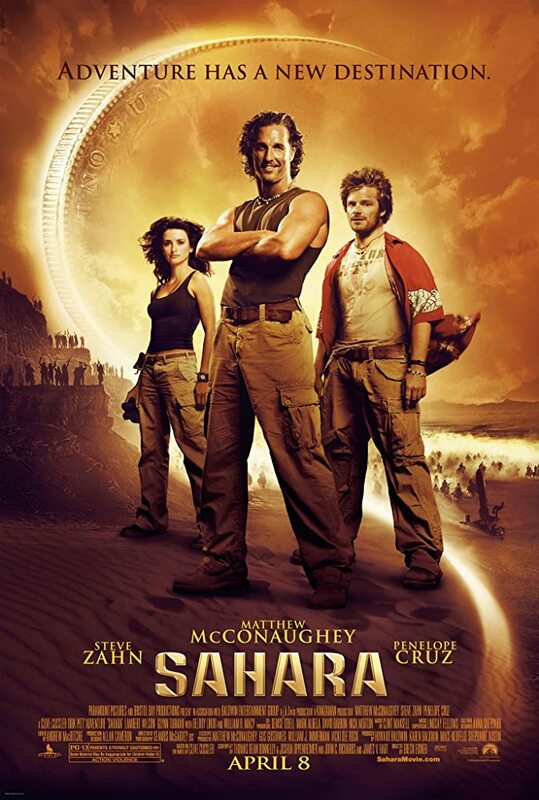 If you love movies like Indiana Jones or National Treasure, you will not want to miss out on Sahara! Looks like this one is available to rent online at all the usual places. I love this post about Sahara. I LOVE the fact that the critics hated this movie…..while the rest of us (think America as a whole) Loved this movie. The only movie critic that I trust also wrote King’s Warrior. Al Giardino is the movie. A FUN MOVIE for families to watch together! Thanks Jenelle! You are welcome. Thanks for the high praise! Now I want to go watch it again! Me too! That is one fun side-effect of doing this series… it’s reminding me of all these favorite movies I haven’t seen in a while! Ooh, this looks fun! Steve Zahn is hilarious. XD I’ll have to check this out! It is such a fun movie! Let me know what you think if/when you watch it! The young adults group at my church watched this for a movie night! It was great! It’s definitely in the vein of National Treasure (we could say it IS a national treasure, ho ho ho).